Previously using the Home Sharing Feature could only be used between computers. With the iOS 4.3 update you can now stream your iTunes library from computers and your Apple devices…here’s how. Here we’ll take a look at setting up Home Sharing between iTunes on a PC to other iOS devices, but the steps are essentially the same on a Mac as well. 1. Make sure you have your iPhone, iPad, or iPod Touch setup with iOS 4.3 which we previously covered. You’ll also want to make sure you have the latest version of iTunes for PC (10.2 or above). 2. Also, for this to work you’ll need to have all of your devices and PC on the same home network. To enable it, open iTunes click on Advanced, the Turn on Home Sharing. 3. Enter in your Apple ID and Password, then click on Create Home Share. 4. You’ll then get a message letting you know Home Sharing has been successfully set up. 5. Now grab your iPod Touch and tap on Settings then Music. 6. 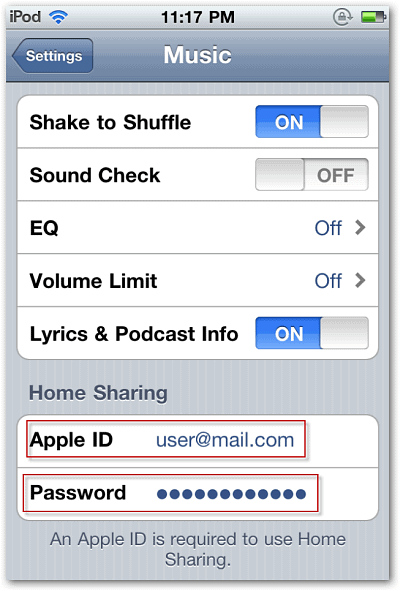 Under Home Sharing type in your Apple ID and Password. 7. Go back to the Home Screen and tap on Music. 8. Tap on More then the Shared library will appear…tap on that. 9. Then tap on your shared iTunes library. 10. This will bring up all of your music, video, podcasts, and more that you can stream to your device. 11. Tap on the song or album you want to listen to and enjoy! 12. If you’re using an iPad, after you setup your Apple ID and Password, tap on iPod from the Home Screen. 13. Tap on Library then the library you’re sharing. 14. Remember that you’ll need to keep iTunes running on your PC to access the library. Also, everything needs to be running on the same network. The new Home Sharing feature is great if you want the ability to access your library from other devices while moving around your house. @Bali: Thanks for the suggestion. It looks like it might be worth a purchase. Would be cool if there was a lite version to try out. I seem to have missed the part of how does the data get to your iphone – pod wi-fi or internet ? @South Parkinson: It’s all over Wi-Fi, so all devices need to be on the same network.